Has anyone colormatched the headlights? Discussion in '2nd Gen. Tacomas (2005-2015)' started by twk62390, Oct 24, 2010. So many people have the BHLM so im wondering, has anyone painted the lights some other color to match their truck? I searched for it and couldnt find any. 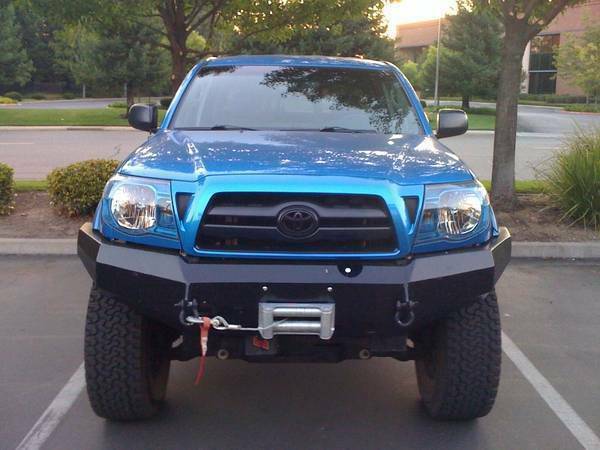 I have a silver tacoma and am thinking about trying it this week, even though there may not be much of a noticable difference between silver and chrome from a distance. So I am just curious if anyone else has tried this? I don't remember their names, but I know a couple of people on here have done theirs SWB, and I think there's one guy on here that did red. Maybe someone will chime in with some names for ya. I've got mine white, I don't have great pictures of it yet but you can take a look. I'll get better pictures up shortly. The guy who did his blue gave me the idea actually. I liked the idea of the BHLM but am not really into just blacking everything out on my truck. I used Krylon Fusion flat white paint. It's not exactly the same color as the superwhite, but behind the lens, you have to look really close to see the difference. For what it's worth, I think it'll look good. It'll be subtle and most people won't be able to tell the difference from the stockers but it looks clean in my opinion. SWB looks very nice with color matched lights... I don't believe I have seen anyone do silver yet though. That white looks really good. I think I'm definately going to try it. I plan on doing it silver and tinting the carrots. I guess if it doesnt look good its not like its that hard to change them to black. I really like the white but i think the blue ones look even better. Im going to start working on mine tomorrow now. I probably just find some silver duplicolor because i dont really think it will be noticable if it is off by a little. any pics of these completed? OME 887 on Bilistein 5100s. SPC UCA. Revtec Diff drop & OME Driveshaft spacer. AAL rears. SCS F5 16x8 w/ Nitto Ridge Grapplers LT285/75R16. Damn, That looks really good on that white truck. Gives a high end look. My buddy painted mine reddish pink when I was in the hospital. Looked funny as hell.